I am going to go out on a limb here and disagree with many of my colleagues in the press. I think that Hot Feet is a show that succeeds in spite of its flaws. This show strings together songs by Earth, Wind and Fire with a few new songs. The story is a miasma of interconnected sub-plots. Kalimba wants to be a dancer and her mother thinks it is a bad idea. Mr. Serpentine wants to be remembered forever for his choreography. The assistant choreographer wants to break away and start his own dance company. The choreographer to the Devil wants people to buy his sparkly red shoes in exchange for their souls. Naomi, Mr. Serpentine's girlfriend and principal dancer, wants to avoid being replaced by Kalimba, the new dancer in the company. And then there is the little white girl who temporarily gets trapped in the show within the show - she wants to be a dancer too. The story of Kalimba, by the way, is the show within the show within the show: the devil's choreographer tells the story of Kalimba to the little white girl. Basically this is a dance concert trying to be both a Greek tragedy and a music video with a plot that combines Faust, Oedipus (sort of) and Dirty Dancing. Hot Feet is a musical, but it has more dance numbers per minute or per square foot than your typical musical. The dancing is high energy. The choreography and dance style tends to be very pop and lock hip-hoppish, MTV-ish most of the time, but not always. I did think that the dancers were, on a number of occasions, a little overpowered by the volume of the music. I think that both the music and the dancing would be better off if they didn't have the music turned up to 11. The night I attended the show, Dionne Figgins, the understudy for the role of Kalimba, had stepped into the part. Ms. Figgins had nice extension most of the time, and the rest of the time, when she really got going, she had great extension. The end of the first act was marked by Anthony the assistant choreographer in the show's fictional dance company (Michael Balderrama) raising up Kalimba in a terrific star lift (where he raises her high in the air using one arm while her limbs are spread out and raised even higher). The costumes were quite varied. The show started with all of the dancers wearing day glow outfits. Later, dancers were dressed in these red and black outfits that blended into the red and black urban landscape backdrop. 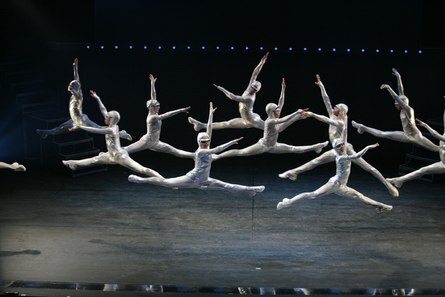 The second act opens with the dancers in weird silver outfits that look vaguely like something out of Momix. It was clear from this number that this show is trying to push some boundaries and doesn't want to be just a music video. This show has a lot of dance for dance's sake. The choreography tends to be, on average, perhaps a little too celebratory: lots of high kicks and waving arms - but that is only a mortal sin for dance critics who have lost sight of the big picture of audience development. To put it another way, the show is guilty of a little irrational exuberance. On the whole, I liked both the dancing and the choreography (with exceptions noted below). The audience reaction was clearly positive. Maybe it wasn't the greatest choreography I have ever seen, but it was enjoyable and it was danced with enthusiasm (and several impressive back flips and a very accomplished one footed hold). That being said, the show does have flaws. Some of these flaws could only be fixed by ripping the show apart and starting over. Other flaws could be easily fixed. The main problem with the show is that the plot is rather thin and often doesn't make a lot of sense. The show succeeds on its dancing, so the problems with the plot don't bother me that much, but if it were my show, I would rip it apart and start over. The plot is often driven forward by gimmicks and major plot twists that seem to come out of nowhere. For instance, in the second act it is revealed that Kalimba's mother used to be a dancer in Mr. Serpentine's company and that Kalimba is their daughter. Something that major ought to have more build up. As for gimmicks, the show relies several times on the extensive display of beefcake (well muscled, bare chested guys). And then there was the dance number with costumes that looked like something from Tron crossed with the Borg. Very visually arresting, but what it had to do with either the plot or the logic of the show within the show, I have no idea. This is a show that is trying for a sort of Victorian melodrama. I can live with that, but because of the show's overuse of gimmicks, the most coherent moral you can draw from the show is "Never perform in shoes you haven't rehearsed in." Kalimba dies after her brilliant performance while wearing the Devil's red shoes. He doesn't take her soul, but she is still dead. I think the show is missing a third act that could either be modeled on Dante's Inferno, Orpheus/Orpheo or that episode of the Monkeys where Peter, who had sold his soul to the Devil to play the harp, proves he can play the harp without the Devil's assistance and wins his soul back. Kalimba could go to Hades, prove she can dance without the Devil's red shoes and come back to star in Anthony's dance company. There is one number in the show, however, that combines atrocious choreography with character choices that make no sense and which could be easily fixed. Fixing this number would go a long way towards improving the show as a whole. At one point Anthony, the "good" choreographer who is held up as the contrast to Mr. Serpentine the "evil" choreographer who has made a pact with the Devil to have a successful dance company, is allowed to showcase one of his numbers. Anthony is supposed to be the better choreographer who will rise above Mr. Serpentine's, in Anthony's view, mediocre choreography. Anthony is supposed to be pure of heart. How else could he win Kalimba's love? Yet the choreography that is presented as Anthony's is uninspired. The dancers are clothed in racy costumes that look like something out of Nine, but not quite as elegant. I don't object to the costumes per se, but they don't fit who Anthony is supposed to be. Anthony's dance number had no point in relation to anything I could see. Mr. Serpentine comes on and rips into Anthony saying that Anthony has created terrible, inappropriate choreography. The audience is supposed to not like Mr. Serpentine, but in this case he is absolutely correct. The producers of Hot Feet should just scrap this number and replace it with a rotating set of excerpts from other modern dance choreographers. Jennifer Muller, Pascal Rioult, … there are plenty of people out there who could help make Anthony look like the brilliant choreographer he is supposed to be. What I like about Hot Feet is that it is a show with great potential to convert people who ordinarily wouldn't be caught dead in a dance concert into dance fans. In this sense, Hot Feet fits in the same category as Movin' Out. 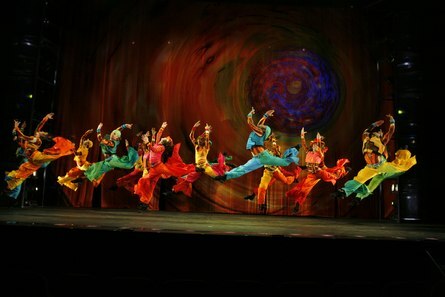 Hot Feet could do a service to the larger dance community while improving its own show by showcasing several other choreographers in this one number. The audience clearly loved the show. The clapping at the end and at several places in the middle was enthusiastic and they were on their feet at the end. The dance community should do some audience research to tease out where this audience is coming from, what in Hot Feet makes them happy, and how we as a dance community might be able to build on that. Hot Feet ensemble in "Getaway"
Hot Feet ensemble in "Rock That"